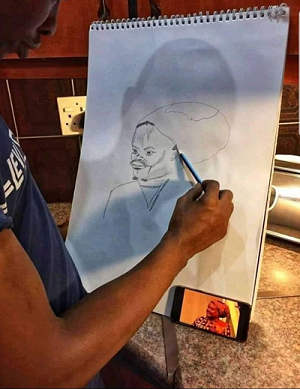 Social media users have suggested a Rasta challenge, calling on amateur artists to paint his portrait. 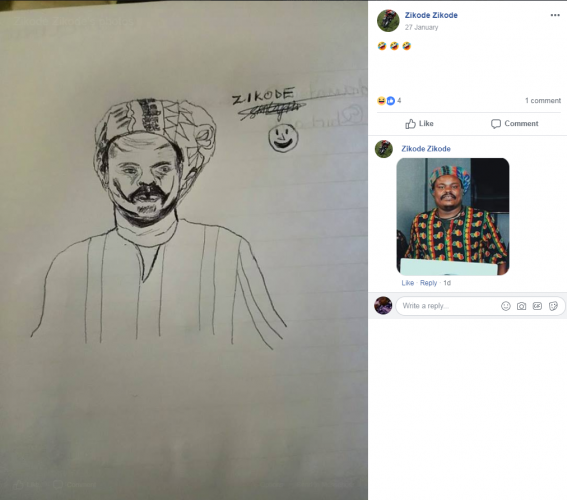 It seems karma has finally caught up with Lebani ‘Rasta’ Sirenje, as people have started sharing portraits of the artist on social media. Rasta has often been mocked for his paintings of famous people, which he seems to always get wrong, according to social media users. Over the weekend, the artist was roasted for his take on late Zimbabwean musical icon Oliver Mtukudzi. While some laughed about his painting, others seemed genuinely aggrieved by it, claiming his depiction was disrespectful. Before Mtukudzi, Sirenje attended the ANC’s manifesto launch at the Moses Mabhida Stadium in Durban, where his depiction of what is believed to be President Cyril Ramaphosa set Twitter ablaze. His previous works, depicting subjects including late rappers ProKid and HHP, late struggle icon Winnie Madikizela-Mandela and American artists Jay-Z and Beyonce, received similar reactions. But now fellow artists decided to give Rasta the taste of his own medicine. The first portrait of Sirenje divided social media users, with some saying it was a true reflection of the artist, while others said it looked nothing like him. Another Facebook user also shared his take on the artist. Some social media users have suggested a Rasta challenge.